The old Rocky and Bullwinkle cartoon show had a series of interstitials with Bullwinkle attempting, and failing, to pull a rabbit out of a hat and Rocky increasingly skeptical that he would ever succeed. As tortured an analogy as that may be, it's how the Bay Ridge community has regarded announcements of the opening of the prodigal Key Food supermarket on Bay Ridge Ave (69th St). It was almost two years ago that the neighborhood was buzzing with rumors that Key Food was negotiating to take over the two large buildings formerly owned by Harry's furniture store. Yet, only a couple of months before that, Key Food announced that it was closing its well-patronized 95th St supermarket. So this latest scuttlebutt left much to be skeptical about, especially when the new location wasn't exactly ideal for a large supermarket. For one thing, there was no parking lot. There was a single-story building across the street that was the old Harry's annex which at one point in its history might have served as a garage of some sort. But with the pillar obstructions I remembered seeing in the old Harry's annex and the nonexistent driving skills of Bay Ridge SUV pilots, they couldn't honestly be thinking about letting soccer moms and cell phone jockeys park their own land barges in there. It would be a day-long fender bender. You could construct bleachers and sell tickets! Then there was the issue of 69th Street itself: a narrow two-lane road that already has serious congestion issues from being forced to service avenue-level traffic. Both local and express buses use 69th Street as do trucks and emergency vehicles. Worse, there's a kitchen wholesale business on the block and their semis often stop traffic for several minutes while the driver threads the needle with his 18 wheeler and the narrow loading dock. Then there was the fact that supermarkets haven't been very successful in north Bay Ridge. Only three blocks away at Fourth Ave and Senator Street, A&P closed a considerably larger store around 2003, and it had outdoor parking. Waldbaum's considered, and rejected, taking over that store after a Duane Reed failed there. Nevertheless, on June 6, 2008, State Senator Marty Golden put some meat on the rumors and confirmed that Key Food had indeed signed a 25 year lease for the old Harry's complex. The announcement also included a Grand Opening estimate of Fall 2008. Fall came and went with virtually no progress being made on either building. In fact, just after Christmas 2008, 244 Bay Ridge Avenue still had the old Harry's For The Home awning, which actually looked in better shape than the "Key Food Coming Soon" banner attached to it. The reason for the delay was that the builder had run afoul of the NYC Dept of Buildings. Despite local political muscle behind this project, DOB slapped a Stop Work Order on Key Food for doing unpermitted work. Combined with a national economy in a tailspin, the future looked bleak for the new Key Food. But the builders corrected the defects and went back to work. 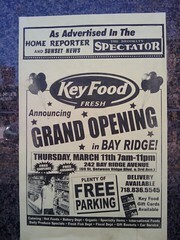 City Councilmen, Vincent Gentile's, blog reset expectations for a late March Grand Opening of the new Key Food. Problem is, he meant March 2009. The day before Mr. Gentile's announcement, DOB visited the site again and hit it with yet another Stop Work order. After that, our burned pols weren't so eager to talk about vaporous Grand Opening dates although other blogs have talked about the owner's estimates of Summer 2009, November 2009, December 2009 and February 14th 2010 Grand Openings. "This time for sure!" 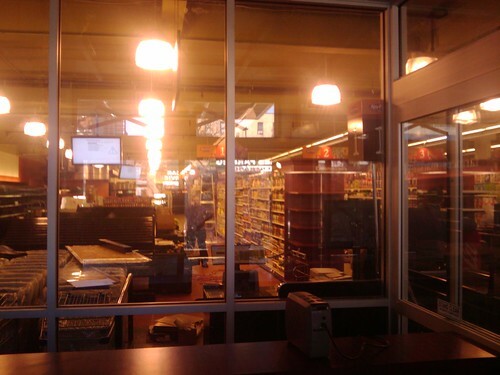 This photo is how Key Food appears today, March 6, 2010. It looks like they'll make their Grand Opening in five days, although it wouldn't surprise me to see it as a "soft launch". Obviously, there's still work going on in the store and the parking lot across the street still looks scary. I don't want to sound ungrateful. I'm thrilled to have a new supermarket in the neighborhood, especially with the sinking quality of Cangiano's. I've been getting tired of the drives to Pathmark, Fairway and Food Dynasty. It took only seven months for the 143,000 square foot Costco to be built in Sunset Park. The 101 story Empire State Building was opened after 14 months of construction. The 5 million square foot Brooklyn Army Terminal was erected in just 17 months. Why did it take almost two years to renovate a pair of buildings for a grocery store? Key Food's shelves have been fully stocked since November, '09. It's curious why they did this five months in advance of opening but it gives me concerns about freshness and construction dust. I think I'll wait until Key Food v1.1 before I do any serious shopping there.